For many years theologians have agonized over the contradictory accounts of the birth of Jesus as given in the Gospels of Luke and Matthew. How can they be reconciled, given their utterly different nature and contents? 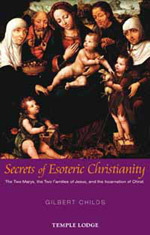 Demonstrating a remarkably erudite approach and authoritative knowledge of biblical sources and other primary texts, Gilbert Childs throws new light on arcane disputes by revealing some of the secrets of esoteric Christianity - in particular the mystery of the two Marys and the two families of Jesus. Such secrets, including the meaning of the 'virginal conception', have lain hidden and protected in Mystery Centres and by initiates over the ages, although in modern times they can be spoken of openly. Dr Childs begins by carrying out a thorough examination of the doctrine of Adoptionism - the notion that Jesus was 'adopted' as the Son of God after his birth. Did Christ incarnate into Jesus at the Baptism in the River Jordan, as some Biblical authorities claim? The author gives an overview of the Gospels, introducing the seminal research of Rudolf Steiner as a key to penetrating some of their enigmas. He then studies the relevance of the ancient Mystery Centres to Christianity, and discusses how Christianity itself can be viewed as 'Mystery'. GILBERT CHILDS attended the Steiner teacher training course at Michael Hall after war service. He later studied at four universities, his doctoral thesis being entitled 'Steiner Education as Historical Necessity'. After teaching at State and Steiner schools he spent 20 years as a tutor in a further education college for severely physically disabled students. He is, in retirement, a full-time author and keen gardener. His published works include Truth, Beauty and Goodness, Your Reincarnating Child, and Understand YOUR Temperament!